Jessa and Ben Seewald and their two sons--Spurgeon Elliot Seewald and Henry Wilberforce Seewald--are on this week's cover of PEOPLE Magazine, on newsstands Friday. The mother of two says her second birth was much easier than her first, telling PEOPLE that it went by so quickly that Michelle Duggar and Jana Duggar nearly missed Henry's arrival. I just listened to Jill and Derick's congratulations to Jessa and Ben. Jill said she's looking forward to holding their little boy. Has it been announced that Jill is having another boy? Yes, a couple weeks ago. Yes, a few weeks ago. Yes, they did. If you look back at older posts you will see it. Why do the duggars sell thier pictures to People?? I know it's money BUT people magazine is NOT a godly example to promote this family!! They need to look at other avenues. for a family that claims to be not worldly they sure do reap the benefits of rag mags and a secular TV station. I get it they need the money to support the family but selling themselves to filthy magazines and a horrible tv channel TLC is NOT setting a godly example. 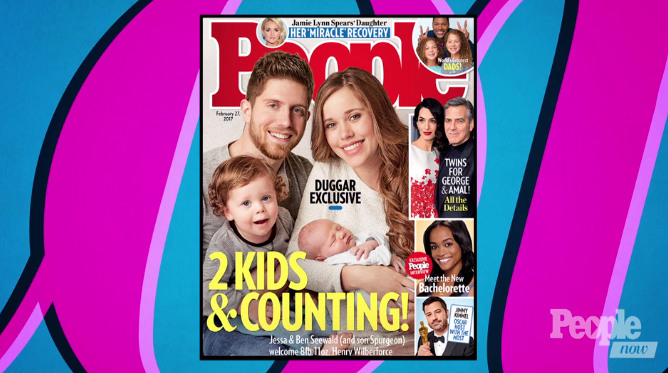 I am also puzzled to why the Duggars chose People Magazine. I am hoping that Lilly and Ellie would be able to provide an explanation since People Magazine does not represent the values the Duggars and many of us blog readers stand for. Pushing that baby out in 5 hours doesn't sound very calm or relaxed. Compared to nearly dying at home bleeding out after the first botched delivery it certainly does. My fourth child I was at the hospital for 16 hours before my son was born and it was calm and relaxed. Having a natural childbirth, made it more relaxing. My third son, was born thirty minutes after arriving to the hospital, and it wasn't as calm. So time doesn't matter. I'm glad she had a good experience this time. Well there are some women who find that kind of labor relaxing. Not this mama! I would have been screaming to be knocked and to ask to be awakened when the baby arrived. It's all a matter of perspective. Compared to how long it took for Spurgeon to be born, I'm sure five hours seemed very calm and relaxed. Time for Spurgeon to have an appointment with one of the aunties and the hair clippers. I agree! The baby curls are cute, but once they hit one or so, they start looking like girls. I know a little boy whose hair was kept long from the time he was little until he was about 7, and it looked ridiculous. I disagree. He's adorable with that hair. I love his little curls! They're so cute! Totally disagree! Those longer (ish) curls look super cute very angelic. Cutting when it inhibits his visual field is quick enough. Gourgeous kids! Why would you want to cut those curls??? He has plenty of time for that. Oh my goodness his curls are ADORABLE!!!!!! He's such a handsome little guy! I think that sort of sounds normal. How long does a natural birth usually take? It depends on the person and pregnancy. I'm pregnant with my fifth child. I've had two natural labors so far. One was 16 hours but it wasn't bad at all. I walked around the hospital and did different things so it was fine. One delivery was so fast, we were holding our son within 30 minutes of arriving at the hospital. A five hour labor was certainly a gift from God, so happy everything went smoothly this time!! And don't cut Surgeons curls yet!! My brother had curls like that till he was four!! Beautiful family!! Each labor is different. Sometimes it goes fast and other times it goes very slow. I've had four children and am pregnant with my fifth and they are all different. So sweet, glad to hear that it was an easier birth this time! Never heard of labor described as calm and relaxed. For real? It really can be when you are able to have the experience that you want. Same here! I wouldn't even describe clipping my toenails as calm and relaxed. I agree Spurgeon diffently needs a haircut. Pretty soon Spurgeon is going to look like Uncle Derick. I'm curious why Jessa would allow a picture to be taken of her lying on the bed with some shoulder showing? And before you 'newer' fans get all bent out of shape from my question, I'm asking because the Duggars have lived by the motto " not to stir up desires that cannot be righteously fullfilled." I'm just wondering. I don't see a problem. At least she's not posting inappropriate pictures like some female members of a famous dysfunctional family like to do. The article said Jessa's water broke just after midnight on Feb 5th. Then it says she had a 5 hour labor---delivering at 4:26 AM on Feb. 6th. So a 5 hour labor/delivery would be impossible. That would be approximately a 28 hour labor/delivery. Her water would need to have broken just after midnight on the 6th to have had a fast 5 hour labor and delivery. Which is it?? It was most likely Feb 6th after midnight. I think there was a typi. It's most likely a typing mistake. It sounds like her water broke after midnight on the 6th and Henry was born later at 4:26 that morning. Because...not all of us women look at our bodies as our own. They are not. They are a gift from God, and we are meant to be a gift to others. That means, for me as a Catholic Christian, laying down my life for my husband, children, and neighbors. We live in a self-centered society, from "me-time" to the "I-phone"...however, I have found that I am truly happiest when I set "me" aside and serve others. Oh--it can and is so very hard sometimes. Not that moms don't need a break...but please don't project onto these young ladies. For myself, it is an immense privilege to give birth--we have NEVER used birth control (as I said, we're Catholic), and I only have 4 children...not everyone's bodies produce children every 18 mos...I've been married almost 14 years...some of my most favorite words from the Last Supper are these: "This is my body...given up for you." Those words mean so much to me as a wife and mother...in so many ways...from pregnancy to birth to extended nursing, my body is given up for someone else. May I continue to ask the Lord for grace to be able to serve as He wills, selflessly, and with pure love. Beautifully said and so true. God bless you. I saw that the magazine is $5.99. I will not pay that much just to read about the Duggar and Seewalds.